I have a crazy maid story today but first I wanted to show y'all the bag that Emory at Emma's Closet made for me! I am SO excited about it and I can't wait to get it! She is mailing it to me today! One lucky reader will be able to choose a cute gift like this. Just go to my blog giveaway post (you can click on the link on the right hand side column) and enter to win! The drawing will be held on May 13th! Who would want to miss this!? Ok, I'm not sure what kind of people this hotel employs but there is one maid that is really crazy! Yesterday when Deaner and I went out for lunch we decided that we would leave the Do Not Disturb sign on the door and just wait to have our room cleaned on Monday. If you want your room cleaned daily you have to take the sign off your door knob by 1pm or else you miss the maid for the day. Fine. We knew we would miss it and we didn't care. When we got home from lunch at 2pm and were walking up to our room, that crazy maid (the one that lectures me about having your room cleaned AT LEAST every THIRD day) practically jumps out of the room she is cleaning on another wing and starts chasing us down waving her arms. Here is how the conversation went. Maid: "Oh! Oh! You are back! Aren't you the people staying in room blah blah blah"? Me: "Hi, yes we are". Maid: "Oh! Well, you knooooowww, I am done with all my rooms now and if you want me to come clean your room I will". Deaner: "Ok, that sounds fine, we were out for lunch, but since you are here, that is fine". Maid: "Oh, oh, well, you knooooowww, you are supposed to take down the Do Not Disturb sign by 1:00om if you want your room cleaned daily". Me: "We know, we didn't think that we wanted the room cleaned, but since you offered, it would be great, thanks"! Maid: "Oh, weeelllll, I guess I can do it since I am already done with all my other rooms but normally, I could have only done it if you took the sign down by 1:00pm"
ARRRRGGGGGGG!!!!!! Listen here lady! We didn't even ask you to clean our room! You stalked us down, offered to clean it because you were done early, and now you are hemming and hawing over it?! PUH-LEASE don't waste our time! Clean the room, don't clean the room, we don't care! Then she asked if we wanted new sheets. Deaner said "no, we just got them yesterday" and she said "oh wellll, ooookkkkkk, I will have to go downstairs and get some" which is exactly what he said not to do! After that debacle we received a lecture about how she was very sorry but the only clean washcloths she had were white and not the usual pink ones we normally get. I don't know about y'all but I don't have a preference. Unfortunately I was in the room today when she just came in to clean and talked the whole time about the "pollens" that were making the rooms dirty. Last time I checked pollen was already plural! I am so mean but good gracious! Today I have been REALLY busy since I had to go to the Exchange, the commissary, and to Steph and Jon's apartment to water their plants. And that was a joke that I am really busy. It's just that I haven't had this much to do in awhile! :) Now I am watching Days of our Lives and getting ready to pick up Deaner at work to go to the big gym to work out. I hope I have some more e-mails by then to keep me busy on that eliptacle for 55 minutes. I'm dreading it! On a fun note, Deaner bought us (and Jon and Steph) Elton John concert tickets last night! I am so excited! Elton is playing here June 30th at this amazing place! There is an open air concert area behind the Kurhaus which is right near Deaner's and I's hotel. Hello Rocketman and Piano Man!! Hope everyone has a great day! Wow, that maid is insane!! Haha, I love reading your stories! And Elton John??? Seriousy?? Excuse me while I die of envy now. Elton John!!! I love him! I saw him in Vegas and his show is GREAT! I would have punched that maid in the face... what a pain in the arse!! Those crazy foreigners and their need for a schedule. I hope you don't have to deal with her tomorrow! The maid sounds looney for sure! Super Cute bag! So jealous about your tickets!! Thanks for stopping by my blog. I'll be sure to add you to my favorites so I can follow you. 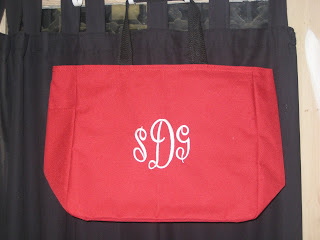 Cute tote bag! And very exciting about Elton John! I CANNOT wait for Elton John, I am doing the happy dance right now!